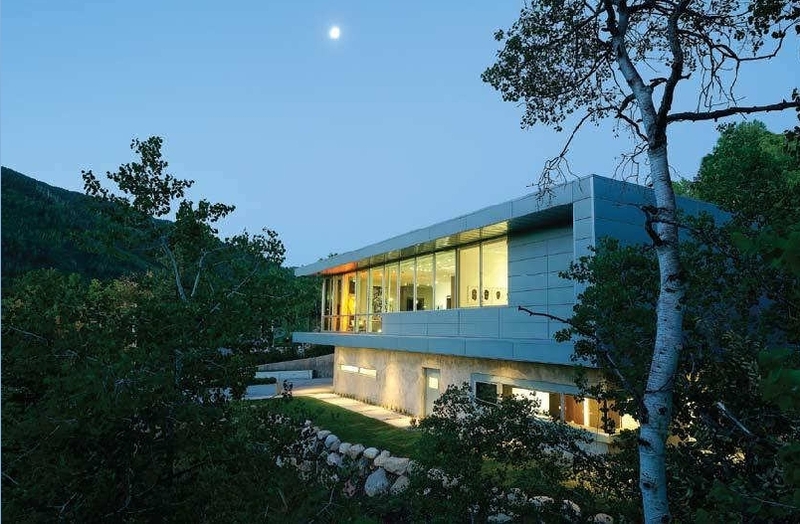 Although mostly known for its high-end luxury properties and epic skiing, Aspen also has produced some of the most innovative architecture in the West, and in turn has been the home to a number of celebrated architects, including three fellows from the prestigious American Institute of Architects (AIA). The same high-end clientele that is attracted to the steep slopes and breathtaking scenery of the Roaring Fork Valley also recognizes the importance and beauty of fine architecture. With a population of about 6,000, Aspen has more architects per capita than other mountain towns in the region. According to AIA fellow Scott Lindenau, Architects design about 97% of the houses in Aspen, which is unheard of in other cities where builders design most buildings. Lindenau is one of three AIA fellows based in Aspen. Larry Yaw and August “Augie” Reno join him in the elite circle of architects who have become AIA fellows in the past decade. There are a total of six architects who have been elevated to AIA fellow status in Aspen’s history. Ted Mularz, as well as the late Sam Caudill and the legendary Frederic “Fritz” Benedict, who was the first trained architect to arrive in Aspen at the end of World War II, have boasted the title in addition to Lindenau, Yaw and Reno. Becoming an AIA fellow is considered the highest honor the organization offers. It is awarded to members who have made contributions of national significance and who have achieved a standard of excellence in the profession. Out of a membership of more than 80,000, there are fewer than 2,700 AIA members distinguished with the honor of fellowship, or about 3% of all members. In Colorado, about 50 architects have become fellows. Part of the beauty of talking about Aspen’s style of architecture is its eclectic versatility. From the brick and mortar buildings of the silver mining days to the minimalist buildings of the modern era, Aspen has led the industry with iconic buildings representing architecture from each era in its short history. Yaw, who is a principal architect at CCY Architects in Basalt, was recognized by the AIA for bringing contemporary design to the more traditional architecture of the mountains. By using traditional materials that are seen in older buildings in the area together with modern materials, Yaw’s buildings find a balance between acknowledging tradition while progressing forward with more contemporary buildings. Obermeyer Place, which completed construction in 2006, is one such example. The community structure provides commercial spaces on the ground floor, and above are affordable housing units and 22 high-end residences. The building’s exterior juxtaposes the red brick of the 18th -century Wheeler Opera House next to modern metals to create a clean, modern look with a nod to the city’s history. Lindenau, who was elevated to fellow for his contributions to design this year, similarly finds the right balance between incorporating traditional materials with contemporary. His designs use everything from familiar elements like glass and concrete to unfamiliar materials to create unique patterning on the “skins” of buildings. Lindenau is a principal at Studio B Architects in Aspen. The firm has designed community buildings in Aspen like the Aspen Volunteer Fire Department firehouse, the museum, and the Aspen Middle School. Lindenau’s work has crossed regional borders. In addition to his Aspen projects, he has designed buildings in California, Illinois, Mexico, the Virgin Islands and Kenya. “We were designing buildings 30 years ago regarding the site orientation,” he continued, adding that there are various variables a designer can control to make a building reach maximum efficiency. “But, now, I think people are more conscious when designing projects about utility use, like specifying plumbing fixtures, and creating heating systems that are energy efficient.” Reno Smith Architects builds with sustainability in mind, focusing on long term, durable homes and environmentally friendly structures. All three fellows agree that the industry as a whole is moving toward prioritizing sustainability, and that it is partly out of necessity. “Sustainability is not a fleeting fad,” Yaw said. “It is a mandate of habitation in a changing world. Beginning with ‘walk softly on the land,’ sustainable choices and energy conservation should be a fundamental element of both design and lifestyle. The challenge for architects is fusing sustainable strategies with creative, user-inspired design.” Lindenau echoed Reno and Yaw’s argument noting that while people will continue to build architecturally significant structures, they will be more conscious about how they will spend their money. The fellows also agreed on the prediction that in the coming years the majority of activity will be in the private sector. Including second homes, residential buildings will be the center of innovation in the industry due to the down economy and the newness of most public buildings in Aspen. Regardless of which sector sees the most development, Aspen will continue to be a leader in the industry.